Monarch of the Glen completed. Only the antlers of the dead deer on the roof are visible. A crepescular photo of the Scottish coach after fitting the flickering lanterns. The dead deer – which may or may not be the eponymous Monarch of the Glen – is more visible, but somewhat lost in the shadows. 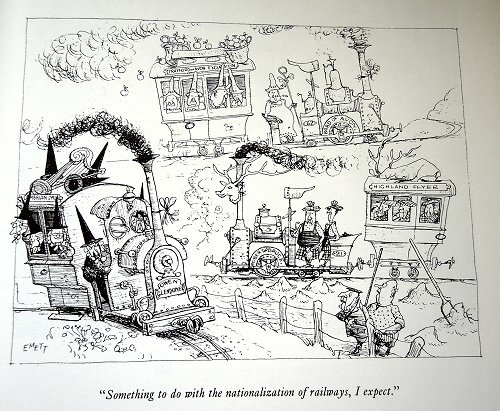 One of Rowland Emett's illustrations shows three carriages 'themed' with stereotypes of Scotland, Wales and Stratford-upon-Avon. Although not part of Emett's illustration, at the Whittlecreek and Eaton St Torpid Heritage Railway similarly-themed coaches will be pulled by an Irish locomotive. 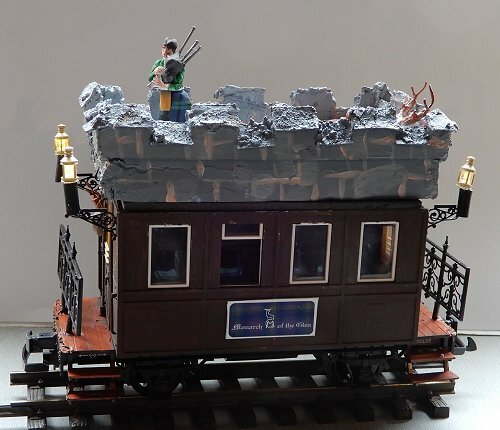 In keeping with the Welsh coach, with a quartet of Welsh harpists, and the Northumbrian-themed wagon, with a duet of Northumbrian small-pipes players, this Scottish-theme carriage has a bagpiper. And, as the only proper way to play pibroch (also known as piobaireachd or Ceòl Mòr) is pacing the battlements of a baronial castle, this vehicle needed to look as much like a Scottish castle as possible. 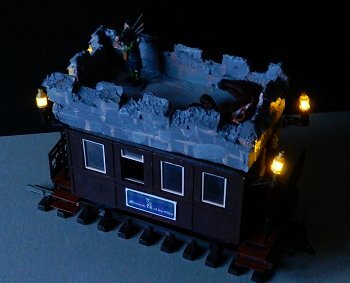 Sadly the management of Whittlecreek and Eaton St Torpid Heritage Railway were unable to install a proper castle on top of a coach, but they commissioned someone skilled at making theatre scenery to do the best they could. Although presumably food hygine regulations have since put paid to the practice, in the early 1980s – when the management had two splendiferous cycling holidays around the Western Isles – deer carcasses were transported on and off the ferries in baggage-handling trolleys without any additional 'packaging'. Presumably they also travelled by rail in the same manner. Clearly Rowland Emett was aware of such practices as in his illustration above there is a suitably impressive deer carcass on the roof of his 'Highland Flyer'. Although officially known as the 'Monarch of the Glen' this carriage is only ever referred to by the management of Whittlecreek and Eaton St Torpid Heritage Railway as 'the Scottish coach'. It's something to do with a certain play by William Shakespeare only being referred to as 'the Scottish play' to avoid bad luck. The Scottish Nationalist Party insist that they have no connections with the Stuart Loyalist Army and strongly refute any suggestions that the SLA is the military wing of the SNP. Thanks to Neal Caimbeul aPheighinneag of Cnocbarra for revealing the existence of the Stuart Loyalist Army. And not just biscuits. 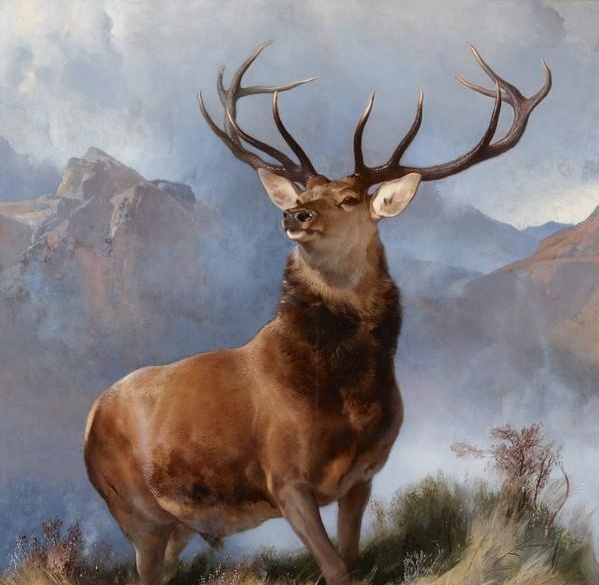 The painting cleary influenced whoever came up with the Glenfiddich whisky logo. 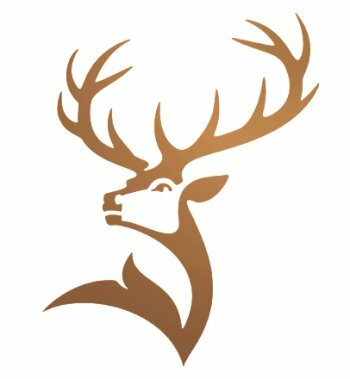 However, as Glenfiddich means 'valley of the deer', then it is appropriate appropriation. Two different covers for The Monarch of the Glen. 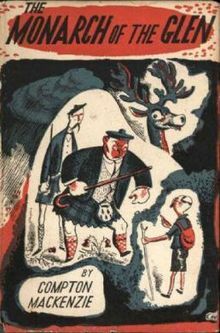 The Monarch of the Glen is also the name of a Scottish comic farce novel by Compton Mackenzie published in 1941 which is based around life in the fictional Scottish castle of Glenbogle. American millionaire Chester Royde is in Scotland with his new bride Carrie and sister Myrtle to research Carrie's Scottish ancestry. Their new 'relatives' turn out to be rather more authentically Scottish than they bargained for. Ben Nevis, Laird of Glenbogle Castle, is cash-strapped and fiercely protective of his lands and the Macdonald clan spirit, but he's not above attempts to marry heiress Myrtle to one of his brawny sons. When a group of hikers stumble on his moor and spoil a day's hunting, it sparks an all-out war between gentry and commoners. 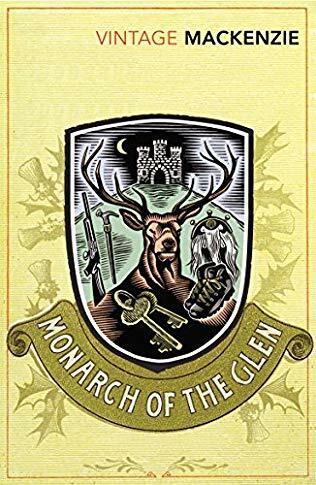 The BBC television series Monarch of the Glen, broadcast between 2000 and 2005, is based on the novel and its sequels. The management of Whittlecreek and Eaton St Torpid Heritage Railway felt obliged to read Mackenzie's novel but gave up at page 32. A quick skim through odd pages of later chapters revealed it remained dire. But don't let that put you off, the management rarely finish reading works of fiction. Indeed, they rarely start reading them in the first place. The main part of the coach is a lightly-modified then repainted LGB 'Rio Grande' vehicle. Those who have been paying attention will know that the roof was re-purposed for the Welsh coach. The battlements on the replacement roof are from foam-cored board, covered with a thin but uneven layer of Polyfilla to aid the representation of stone, then sprayed with grey undercoat. By the fourth fifth attempt things were beginning to be heading in the right direction. The underlying problem (somewhat literally… ) was that the Polyfilla just wasn't uneven in the right sort of ways. After several weeks of unremitting prevarication, out came a tin of rather nice clear matt polyurethane varnish. A ration was poured into a disposable container and then both builder's sand and finely-ground ball clay were stirred in until the mix was no longer rather nice and clear. Instead it was nicely gloopy – thick enough to have texture but thin enough to be applied with a small palette knife. The end result was a bit like a 1/20 scale version of 'prewar council house stucco' – more precisely, a council house with pretentions to be a baronial castle. When dry assorted greyish paints were applied to make it look like badly-done stage scenery. (The management were involved in twelve-inch-to-the-foot versions of such matters while still at secondary school – including being hit on the bonce by the head of a carpenter's hammer being used about six to eight feet above him which suddenly broke off. Broken skin but not a broken skull… ) But to those unaware of this intention it simply looks badly done. The moulded seats in the LGB coach were re-upholstered using Black Watch (a.k.a. 'Old Forty-Twa') tartan ribbon from Jaycotts. A bit fiddly but the work was assisted by a couple of generous measures of Bunnahabhain single malt Islay whisky. Given the amount of money being spent on rolling stock, you might well be wondering how the management of Whittlecreek and Eaton St Torpid Heritage Railway can afford generous measures of the very best single malt on the planet. They can't – this bottle was a gift. The balconies on the LGB coach were replaced with railings adapted from 1/12 scale doll's house parts supplied by The Dolls House Emporium. Not quite baronial enough, but the thought of doing intricate 'wrought ironwork' at 1/20 scale did not appeal. If the management ever get the inclination then something totally pretentious can be substituted. The photograph below gives an idea of how wonderful wrought iron gates can be without being pretentious. 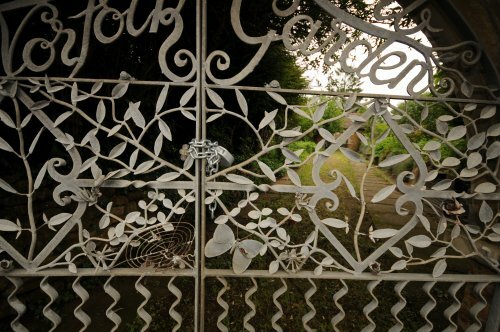 Wrought iron gates depicting leaves, a butterfly and a spider's web. The dead deer on the roof is from brown leather glued suede-side-out around an aluminium wire armature. Its feet are from black Milliput. The antlers are white Milliput around an aluminium wire armature, as are the two sets of mounted antlers next to the doors. Four rather nicely-made lanterns supplied by Maritime Models are supported by the moulded brackets which originally decorated the corners of the roof. These lanterns are lit by flickering yellow LEDs, with a 10kΩ variable potentiometer to control the brightness. The ladder was supplied by Cambrian Model Rail; this was already in the bits box else two coffee stirrers and some cocktail sticks would have quickly been converted into a wooden ladder. The bagpiper, Don MacDonald, is a composite. The arms and torso are from a 1/25 scale figure supplied by Dorspring Models but the legs and head are from the Preiser 1/20 scale 'Adam' kit. The kilt is the same Black Watch tartan ribbon used for the seats. His sporran is the tip of a flat paintbrush, sawn off through the ferrule then the bristles bonded to the ferrule with superglue. His bonnet is Milliput and the bagpipes are from Milliput and panel pins. He also wears a sgian-dubh, but this cannot easily be seen where he is standing.